Getaway to Chamberlin's Ole Forest Inn and you can spend your days enjoying the best of what the Eastern Upper Peninsula has to offer in area attractions. We are fortunate to be near the Erickson Center for the Arts, Seney Wildlife Refuge, Nature's Kennel Dog Sleds, Pictured Rocks National Lakeshore, Tahquamenon Falls, Oswald's Bear Ranch, Whitefish Pointe Bird Observatory, Shipwreck Museum and much more. 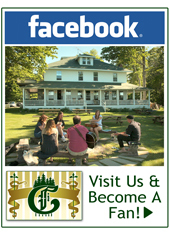 Chamberlin's Ole Forest Inn wants to help make your visit rich with great area attractions, activities and memories. Select one or all of the great Itineraries below and make your next vacation to Michigan's Upper Peninsula the best ever! 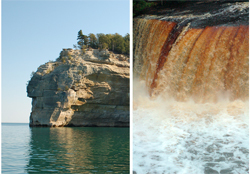 Experience the majesty that is Pictured Rocks National Lake Shore. Cruise the distinctive Lake Shore from the comfort of a double-decker tour boat. Then explore it’s inland offerings as you hike one of the many inland trails through pristine forests and past cascading falls. If you like the sound of roaring water, Tahquamenon Falls will leave you breathless. The largest waterfall East of the Mississippi the Falls and their surroundings are breathtaking year round. Hike, bird, paddle and be sure and bring your camera. Select button above to view entire itinerary. Loons, bears, and lighthouses oh my! Up for a little adventure. Paddle the Manistique River where wildlife abounds, you may spot a beaver or deer along the shoreline. Later in the day get a close up look at black bears in three natural habitats, the owner of this unique rescue ranch will give you a tour and fondly tell the story of how each bear came into his “family” as he refers to them by name. Complete your wildlife experience with a driving tour or hike through the Seney Wildlife Refuge. Either way you will encounter a wide range of wildlife habitats. There are excellent opportunities to view bald eagles, common loons, trumpeter swans, ospreys, sandhill cranes, white-tailed deer, and beavers. Explore a region where places on the map read like prayers and incantations…Seul Choix, Kitch-iti-kipi, and Hiawatha. This trip offers you a plethora of maritime experiences from exploring the history of Suel Choix Lighthouse, to the mystery of the Kitch-iti-kipi Springs. Two hundred feet across, the 40-foot deep Kitch-iti-kipi is Michigan's largest freshwater spring. Over 10,000 gallons a minute gush from fissures in the underlying limestone. The crystal clear water gives way to trout and other underwater wonders as if suspended in air. The Sand Dunes of the Hiawatha National Forest offer a quiet, reflective place to view both the wonder of Lake Michigan’s splendid shoreline and the beauty and diversity of the National Forest.